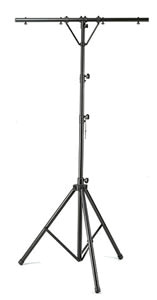 Odyssey LTP2 Lighting Stand DJParts - All Variety of Parts that DJ Needs. The black high-quality 12 ft. black aluminum/steel constructed tripod comes with 1 T-bar and support bars. Maximum load capacity: 80 lbs, evenly distributed.